« DOOH Aggregation Is Dead. Long Live DOOH Ad Serving Platforms! Back in March 2012 we helped the Metropolitan Transportation Authority of New York publicise their RFEI for those interested in being the advertising agent or a sponsor of a future network of interactive customer information kiosks, named ‘On the Go!’ Travel Stations. News just in the, that MTA New York City Transit has announced that it will move ahead with the second phase of a pilot project for these On the Go! Travel Stations by rolling out at least 77 more of the interactive touch-screen kiosks. New kiosks placed at the Bowling Green, Atlantic Ave-Barclays Center, Jackson Heights-Roosevelt Ave subway stations, Penn Station and Grand Central Terminal have been offering customers information about their entire trip, from planning with Trip Planner+, real-time service status, MTA Bus Time (where available) escalator and elevator status and local neighborhood maps. As a result of the RFEI process, the MTA will enter into license agreements with CBS Outdoor and Control Group Inc. in a public/private partnership requiring that the two licensees purchase the kiosks and deliver them to NYC Transit for installation. CBS Outdoor will provide 30 kiosks and Control Group will provide anywhere from 47 to 90 kiosks. 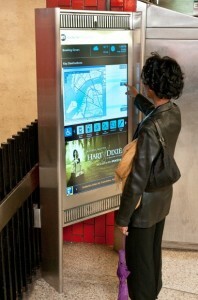 When kiosks are installed during this phase in stations in Brooklyn, Manhattan and the Bronx, NYC Transit will have at its disposal a Digital Signage Network that will allow it to communicate with customers at the station level, especially in times of planned and unplanned events affecting subway service, reducing the need to post paper signage. Paul J. Fleuranges, the MTA’s Senior Director of Corporate and Internal Communications told us “We are excited to begin using digital signage to communicate with our customers on a large scale, as we believe it will provide us with a more efficient communications channel that may also provide an additional stream of revenue”. He added “Digital Out of Home is a dynamic, exciting, growing industry and we’re looking forward to the benefits it will provide to us and our customers”. As part of this proof of concept phase of the pilot, the licensees will have the creative freedom to design the customer interface and to customize the transit-related applications that will reside on the kiosks, while also selling and displaying advertising to defray the related capital and operating expenses. Once their investments have been recovered, the licensees will share revenue with MTA NYC Transit. During this phase, NYC Transit will evaluate customer perceptions, the ability to post and update information quickly, and advertising revenue opportunities. This information will inform decisions regarding deployment of additional kiosks, customer communication strategies and future advertising contracts encompassing digital media and platforms. The On the Go! Travel Station kiosk was designed by Antenna Design New York Inc. and fabricated by Comark Corporation. This entry was posted on Monday, March 18th, 2013 at 09:36 @441 and is filed under DailyDOOH Update. You can follow any responses to this entry through the RSS 2.0 feed. You can leave a response, or trackback from your own site.